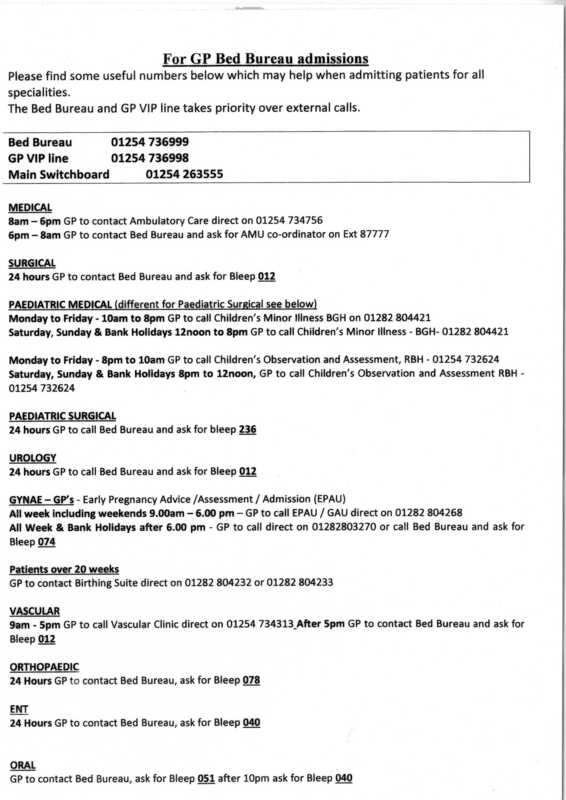 ARRANGE ANTENATAL SCAN WEEKDAYS 01282 804268 Gynae Assessment Unit after 6-8 phone will transfer to 804014 WEEKEND 804014 Gynae and Breast Care Ward DIRECTIONS Phase 5 at Briarfield Road past shop 2nd Floor Early Pregnancy Unit. Try to have FULL BLADDER. East Lancashire Hospitals NHS Trust is pleased to announce that a new Ambulatory Emergency Care Unit (AECU) will open at the Royal Blackburn Teaching Hospital on Friday 14 September 2018. The AECU will manage adult patients with a range of conditions including those with low risk chest pain and suspected pulmonary embolisms. The unit will focus on assessment, stabilisation and treatment of patients who require acute hospital services but who can be successfully discharged home the same day. It is acknowledged however, that some patients may require admission to the Acute Medical Unit (AMU) for further treatment. Acute medical referrals from GPs to the Emergency Department or the Urgent Care Centres will be directed for assessment to the AECU. In addition to this, for those patients who require a return follow up appointment, there will also be a new Ambulatory Care Review Clinic service. This will operate for three hours per day, initially for 2 days per week expanding to 5 days as we progress. The AECU will be led by a specialist nursing team and consultant acute physicians with multi-disciplinary team input. The purpose built unit aims to improve quality by enabling patients to access appropriate services earlier on in their pathway. The AECU will also support the system to achieve a sustained improvement in the 4 hour standard. Opening on Friday 14 September as a 7 day service operating from 8am -8:30pm. The last admission time is 6pm. The unit will be relocating from the old ambulatory care unit to the new site on level 1 RBH (The old admin/bed office corridor). Direct GP referrals can be made by calling 01254 734756 during opening hours.